There are always grey areas in life. I'm never sure how I've done on exam until I get my mark back (which reminds me, I'm currently freaking out about my exams). I often misinterpret hazy text messages. And there is always that occasion when I buy a dress that seems right at the time, only to realize I actually hate it once I've already removed the tag. Generally, 'maybe,' 'sort of,' 'kinda,' and 'possibly' are not the greatest, most coveted words around. I mean how would you feel if someone RSVPed maybe to your birthday party or told you they only 'kinda' like you. Not great, huh? But there are some instances where sort-of is a wonderful, wonderful thing. And this just so happens to be one of those times. 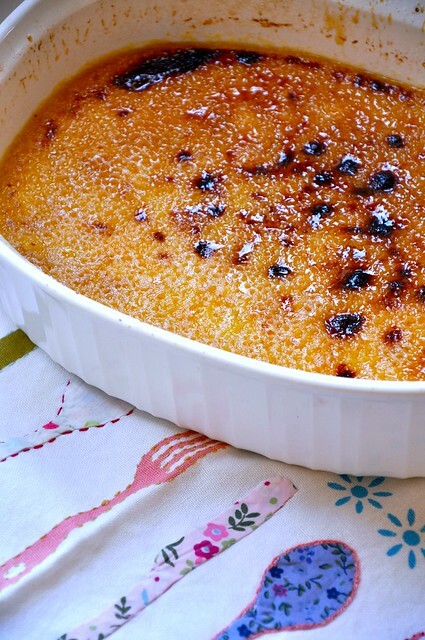 This dessert isn't quite a custard, but it isn't quite a crème brûlée. It's more of a hybrid. Great French pastry chefs would surely balk at this recipe. However, what it lacks in tradition, it more than makes up for with a lovely, creamy flavor and a smooth and pillowy texture. 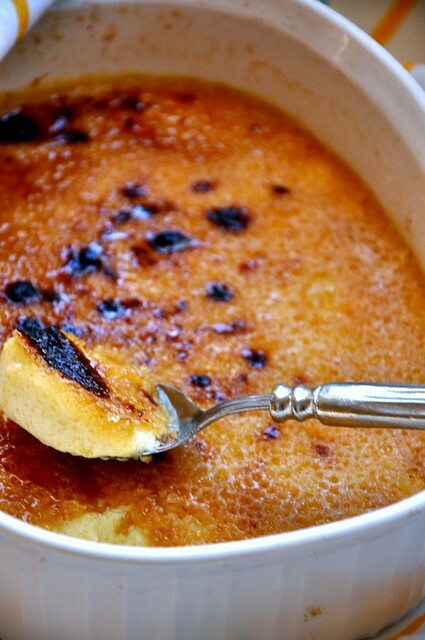 And who doesn't just love cracking the top of a crème brûlée with a teeny tiny spoon? Preheat oven to 300 degrees. Lightly grease a 7-cup capacity oven-proof dish or 6-8 small ramekins. Gently heat the milk and heavy cream in a small saucepan until warm to the touch. In a separate bowl, whisk together eggs, yolks, and sugar. Pour warmed milk mixture into eggs, and whisk to combine. Stir in vanilla extract, vanilla beans, and nutmeg. Pour mixture into oven-proof dish or divide between ramekins. Place oven-proof dish or ramekins in a baking tray and fill tray with water halfway up the sides of the oven-proof dish or ramekins. Bake for 1 hour or until the custard is just set. Remove from oven and let cool for five minutes. Refrigerate for 30 minutes. Sprinkle with sugar to cover entire custard. 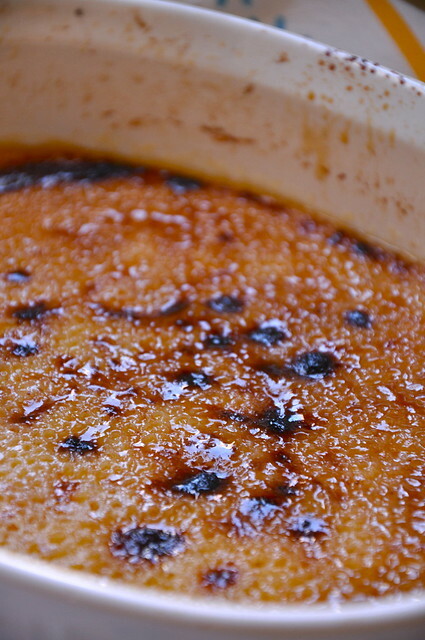 Turn on broiler and return custard to oven until sugar is golden and bubbling. Remove from oven and allow to set. Sprinkle with another layer of sugar and return to oven until sugar is golden and bubbling- this will help have a thicker, more crackable crust. Refrigerate until ready to serve. 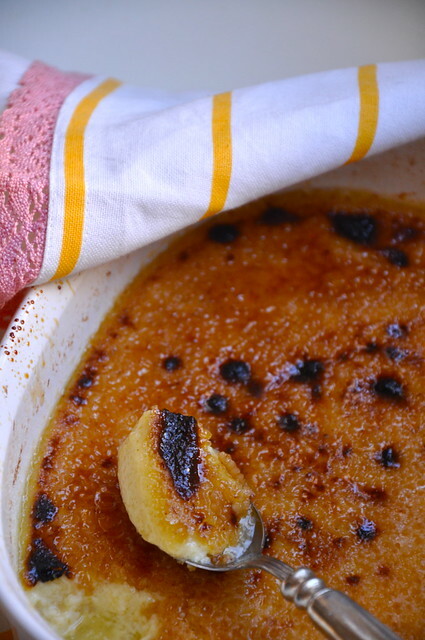 I am not a huge creme brûlée girl but this reads nicely, so I may just need to give it a go!